Chris and Jimi met in 1997. They met over motorcycle parts but bonded over wine. Chris worked alongside Jimi at WillaKenzie Estate and Maysara Winery and also worked in the cellar at Brooks. Chris was one of the many friends who stepped in to make Jimi’s wine in 2004 and became the full-time winemaker at Brooks Winery in 2005. He has continued Jimi’s gentle approach to winemaking, his commitment to biodynamic farming and his desire to express the terroir of the Willamette Valley through the wines. Oregon is known for its Pinot Noir, and Brooks produces elegant ones. But, in addition to Burgundian varieties, Jimi loved Riesling and he imparted his passion for the grape to Chris. Riesling was actually one of the pioneering varieties planted in Oregon. Today, there are 782 acres of Riesling planted in Oregon. It may be a minor grape variety in Oregon, but Brooks Winery is showing what a versatile and expressive white wine it is. Riesling is a grape that speaks to place, and it is very much at home in Oregon, specifically in the Willamette Valley. The climate is relatively mild throughout the year, with cool, wet winters and warm, dry summers, and the soils are ancient volcanic and marine sediment. Brooks Winery is located in the Eola-Amity Hills AVA where they have an 18-acre biodynamically-farmed estate vineyard. The estate vineyard includes five acres of self-rooted Riesling that was planted in 1975. 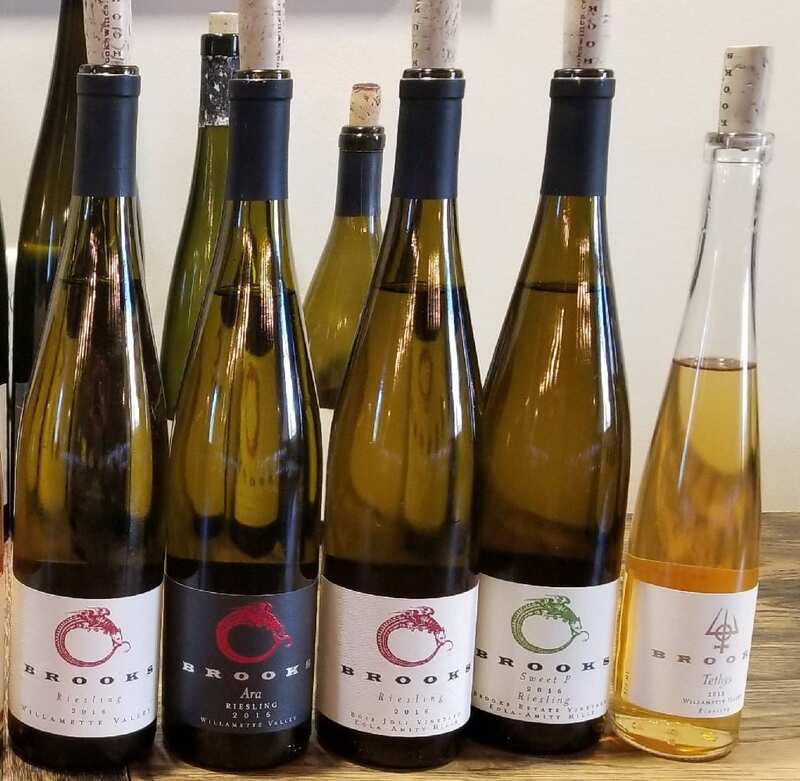 In addition to Pinot Noir and aromatic white wines, Brooks produces 22 Rieslings from 14 different sites in the Willamette Valley. They purchase Riesling from vineyards across the Willamette Valley, including Yamhill-Carlton, Dundee Hills, Chehalem Mountains and McMinnville. This allows them to highlight the diversity of the region, and of the grape, and I experienced this during a recent tasting at the winery. Brooks 2016 Estate Riesling, Eola-Amity Hills AVA ($32) – A dry Riesling with 10.6 G/L of residual sugar, this wine has lively acidity and makes the mouth water. The aromas of lemon, cherry blossom and apple give way to lime, lemon, honeysuckle on the palate. The wine has a crisp and refreshing finish. Only 150 cases produced. Brooks 2016 Ara Riesling, Willamette Valley ($38) – With 14.4 G/L of residual sugar, the fruit from this dry Riesling comes from the estate vineyard and Yamhill Vineyards, blending two areas of the valley. Named after the constellation of the aura, it was first produced in 2003 by Jimi. Since 2004, Chris has made this special wine that has notes of pineapple, nectarine and lime. The aromatic wine has elegant minerality with mouthwatering acidity; 400 cases produced. Brooks 2016 Bois Joli Riesling, Eola-Amity Hills AVA ($24) – A medium-dry wine with 30.1 G/L of residual sugar, this wine comes from fruit planted in the 1980s. The wine has aromas of stone fruit, crisp apple and graphite minerality; 270 cases produced. Brooks 2016 Sweat P Riesling, Eola-Amity Hills AVA ($28) – A medium-dry wine with 36.5 G/L of residual sugar, this wine was first made in 2008, the result of a stuck fermentation. Made with 100 percent native fermentation, the wine has notes of nectarine, mint and cardamom. On the palate, it has beautiful salinity with a long finish with rich acidity. The wine is mouthwatering; 500 cases produced. Brooks 2015 Tethys Riesling, Willamette Valley ($25) – A sweet, dessert Riesling, the wine is named after Tethys, a mid-sized moon of Saturn that is named after the Titan goddess of the primal font of fresh water that nourishes the earth. The grapes are frozen in the freezer and the resulting wine is rich on the nose with notes of apricot and pineapple and elegant acidity on the palate. Riesling can taste so many ways. Its flavor profile can be anything you want it to be and its levels of sweetness can vary from dry to medium dry to medium sweet to sweet. And Brooks Winery has a Riesling in every style. Thanks to community and friendship, Brooks Winery is celebrating 20 years and Jimi’s Brooks love for Riesling lives on. This entry was posted in Wine and tagged Brooks, Brooks Wine, Brooks Winery, Chris Williams, Eola-Amity Hills, Napa Valley Register, Oregon, Oregon Wine, Riesling, Willamette Valley, Wine by Allison Levine.